A Selma-area business wants the men and women on the Selma police force to know they are appreciated. Paula and Stan Perritte with SRS Graphics printed up stickers that read “Support Our Men & Women In Blue” with the Selma police department patch in the center. 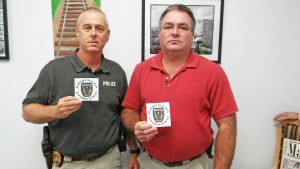 They delivered the stickers to the police officers this week. Selma Police Captain R.L. Daniels said the stickers were a big hit with the officers. There is also a limited supply for members of the public. While supplies last you can stop by the Selma Police Department, Monday through Friday from 8am until 5pm, and pick up a sticker to show your support for Selma Police. There is no charge.